Rhabdoid colorectal tumor (RCT) is a rare, highly aggressive neoplasm recurrent in elderly patients, commonly at the caecum. The molecular mechanisms underlying RCT pathogenesis remain poorly elucidated. The differential diagnosis is with the malignant rhabdoid tumors of infancy characterized by genetic inactivation of SMARCB1 (INI1) or deletions of chromosome 22q12 locus. To shed light on RCT pathogenesis, we investigated genetic and epigenetic alterations in two cases of pure and composite RCT and compared them with the profiles of matched adenomas and normal mucosa. Immunohistochemical analysis, FISH, methylation specific PCR and DNA sequencing analysis were performed on paraffin-embedded tissues. Loss of epithelial markers, (CK20, CDX2 and E-cadherin) and intense vimentin expression was observed in RCTs but neither in the normal mucosa or adenomas. INI1 expression was detected in normal mucosa, adenomas and retained in pure RCT, while it was undetected in composite RCT. Rearrangement of the 22q12 locus was found only in pure RCT. The APC/β-catenin pathway was not altered, while MLH1 immunostaining was negative in RCTs and positive in adenomas and normal mucosa. These expression profiles were associated with V600E BRAF mutation, a progressive accumulation of promoter methylation at specific CIMP loci and additional genes from the normal mucosa to tubular adenoma and RCT. Right-sided RCT could be characterized by epigenetic events and molecular features likely similar to those occurring in the serrated pathway and associated with epithelial-mesenchymal transition. These extremely rare tumors may benefit from the use of new biological molecules specific for colorectal carcinoma. Rhabdoid colorectal tumor (RCT) is a rare lesion mainly localized to the proximal colon in patients with a mean age at diagnosis around 70 years. Only 7 cases of RCT have been reported in the literature to the best of our knowledge [1–3]. This tumor shows an aggressive behaviour and fatal outcome displaying an overall survival shorter than 12 months [1–3]. The diagnostic hallmark of this neoplasm is the presence of rhabdoid cells characterized by an eccentrically located and large nucleus, prominent nucleoli and cytosolic aggregates of intermediate filaments [1–3]. The amount and distribution of the rhabdoid component in neoplasms is highly variable ranging from “composite,” in which the rhabdoid elements are associated with adenocarcinoma, to the “pure” rhabdoid carcinoma without an evident epithelial component [1, 2]. The main differential diagnosis is with the malignant rhabdoid tumors (MRT), a neoplasm more common in childhood and characterized by genetic inactivation of SMARCB1 (SNF5, INI-1), a component of the SWI/SNF chromatin remodelling complex or deletions of chromosome 22q [4–6]. The events involved in RCT pathogenesis, however, remain poorly elucidated [1–3]. In order to shed light on the molecular mechanisms underlying the stepwise rhabdoid carcinogenesis, we investigated the genetic and epigenetic alterations involved in two RCTs and compared with matched adenomas and normal mucosa. Paraffin-embedded specimens of the neoplastic glandular and rhabdoid components of a pure and composite RCT were studied and compared to the matched normal mucosa and adenomas. A large and irregular carcinoma, measuring 10 × 10 cm and graded as T3N1M0, was diagnosed at the right colon and surgically removed in a 71-year-old woman at the Rummo Hospital, Benevento, Italy. Histologically, the tumor showed rhabdoid features without an apparent glandular component (pure RCT). Immunophenotipic, morphological and molecular findings supported its colorectal origin . The patient was affected by essential hypertension and declared that her mother died of colorectal carcinoma (CRC). After surgery, she underwent adjuvant chemotherapy (Folfox for 3 months). Despite a target therapy as second line treatment (4 cycles of bevacizumab followed by 2 cycles of cetuximab), tumor dissemination to the peritoneum and liver occurred and the patient died only 8 months from surgery . The patient, a 73-year-old woman, was CRC diagnosed at the Legnago Hospital (Verona, Italy). The lesion, 10 × 8 cm in size, localized to the right colon, was graded as T4N1M0 . Histologically, the tumor was heterogeneous, consisting of an adenocarcinoma associated with prominent rhabdoid features (composite RCT) (Figure 1a). Six tubular adenomas (TA) close to the carcinoma, were also present, among which the largest in size showed an infiltranting area of neoplastic cells (cancerized tubular adenoma, CTA) (Figure 1b, c). The area of rhabdoid dedifferentiation was approximately 40% of the entire tumor mass. The area of interest for each histological section was isolated and analyzed on the basis of its morphology. Patient’s anamnestic history revealed an essential hypertension and a meningioma at 31 years of age that was surgically removed; Only a sibling, among the proband’s first-degree relatives, was affected by CRC under 60 years of age; no family history nor other malignancies were reported. The patient underwent adjuvant chemotherapy (capecitabin and oxaliplatin) with no clinical benefits. She died for metastatic progression of the disease to the liver only 6 months after surgery . Immunohistochemical markers of colon carcinoma with rhabdoid features, adjacent adenomas and normal mucosa. (a) Hematoxylin&Eosin staining of the rhabdoid component in the composite RCT (case II) (b). Low-power view of tubular adenomas and (c) a larger dysplastic adenoma with a cancerized component contiguous to the main tumor mass of the composite RCT. (d) Membrane β-catenin staining in the large dysplastic adenoma adjacent to the composite RCT. (e) Intense and diffuse vimentin immunohistochemical staining in rhabdoid cells of pure RCT (case I) (f) Intense INI1 nuclear immunostaining in rhabdoid cells of case I (g) Loss of INI1 staining in the rhabdoid component of composite RCT showing appropriate staining of intratumoral lymphocytes serving as internal control. (h) A strong nuclear p53 staining marks the transition from adenoma to carcinoma in larger dysplastic polyps. Magnification (×200 or ×400). Four μm tick sections were used for routine stainings, immunohistochemistry and DNA extraction. Immunohistochemical analysis was performed as previously described [1, 2] by using the following antibodies: VEGFR1 (sc-65442) and VEGFR2 (sc-101560); thymidylate synthase (TS) (sc-33679); APC (sc-896); (Santa Cruz Biotechnology, Santa Cruz, Ca, USA); HDACI (ab19845), HDACII (ab61216), HDACIII (ab-32117) (Abcam, Cambridge, UK); INI1 (25/BAF47) (DAKO Cytomation, Glostrup, Denmark). E-cadherin, 610405 and β-catenin (610153) (Transduction Laboratories, Lexington, KY, USA); cytokeratin 7 (CK7) clone-RN7; CK18-clone DC-10; CK19-clone b170; CK20-clone Ks 20.8; CK-Pan-clone AE1/AE3; epidermal growth factor receptor (EGFR)-clone EGFR.113; vimentin-clone VIM 3B4; desminclone DE-R-11; (Novocastra Laboratories, Newcastle, UK). p53 clone-Bp53-11; anti-MLH1 clone-M1; anti-MSH2 clone-G219-1129; (Ventana Medical Systems, Tucson, AZ, USA). Genomic DNA isolation and sodium bisulphite modification were carried out as reported . The converted DNA was subjected to methylation specific PCR (MSP) using unmethylated and methylated controls in each reaction. The methylation levels (ratios of methylated to unmethylated and methylated DNA (M/U+M × 100) were determined from the relative band intensities and scored as follow: Negative (0-20% methylation); Low (>20-60%); High (>60%) . Primers for promoter methylation analysis were designed and validated as reported . A detailed description of the primer sets and MSP conditions has already been reported or will be provided upon request . EWS rearrangement at the chromosome locus 22q12, MYH, BRAF and KRAS mutations were analyzed as previously reported [2, 9]. To evaluate whether common pathogenetic mechanisms underlie the development of RCT, we analyzed markers involved in colonic differentiation, epigenetic gene silencing, and predictors of drug resistance. Cytokeratin 20 (CK20), E-cadherin, CDX2 and β-catenin immunoreactivity were completely absent in the rhabdoid component and focally positive only in the glandular component (Figure 1d, and Table 1). Vimentin immunostaining was intense and diffuse in both cases, either in the rhabdoid and glandular neoplastic cells (Figure 1e, and Table 1). The matched normal mucosa and all adenomas tested, in contrast, were negative for vimentin and positive for epithelial markers (Table 1). Epigenetic and drug sensitivity markers, such as histone deacetylase isoforms (HDACs I-III) or vascular endothelial growth factor receptors 2 (VEGFR-2), were strongly or moderately positive in both cases, whereas thymidylate synthase (TS) and vascular endothelial growth factor receptors 1 (VEGFR-I) were focally immunoreactive (Table 1). INI1 immunostaining was weakly positive in normal mucosa, all adenomas and strongly positive in the pure RCT; conversely, it was focally positive in the glandular and totally negative in the rhabdoid component of the composite RCT (Figure 1f, g and Table 1). (+++): widespread occurrence, intense expression; (++): Varying distribution, moderate expression; (+): Limited occurrence, low expression; (−) no occurrence or negative. aβ-catenin nuclear localization; Abbreviations: Cytokeratin, CK; pure rhabdoid colorectal tumor, case I (RCTI); glandular (GC) and rhabdoid (RC) components of composite rhabdoid colorectal tumor, case II (RCTII); adjacent tubular adenomas (TA), cancerized and larger tubular adenoma (CTA) or normal mucosa (NM2) of case II. Case I, a pure RCT, is compared to the adjacent distant non-neoplastic mucosa (NM1); histone deacetylase, HDAC; vascular endothelial growth factor receptors, VEGFR; thymidylate synthase, TS. RCTs were characterized by the presence of the V600E BRAF mutation both in the rhabdoid and glandular component and by high microsatellite instability (MSI-H) due to MLH1 inactivation [1, 2]. (Figure 2A). To further investigate the genetic events involved in RCT development, we analyzed by FISH deletions or rearrangements at the EWS locus at 22q12 as they are detected in several MRTs . The 22q12 locus was rearranged only in the pure RCT, but not in the composite tumor (Figure 2A). Subsequently, we compared the BRAF/KRAS mutational and the microsatellite stability status of the RCTs with the matched tubular adenomas (TAs) and normal mucosa. No BRAF mutations were found in all analyzed adenomas and normal adjacent mucosa (Figure 2A). The G12D KRAS mutation, in contrast, was found only in the larger dysplastic tubular adenoma with infiltrating carcinoma (CTA); only in this latter component an intense nuclear p53 expression was present, marking the transition from adenoma to carcinoma (Figure 1h, and Table 1). A negative immunostaining for MLH1 and a variable positivity for MSH2 were found in both RCTs (Table 1). MLH1 and MSH2 expression was positive in normal mucosa and in all adenomas tested, suggesting that high MSI was confined solely to RCTs (Figure 2A). The staining for APC (cytosolic), β-catenin (membrane) and CDX2 showed a normal pattern in all TAs tested and in normal mucosa (Table 1). These unexpected results prompted us to investigate whether other genetic alterations might be responsible for these lesions. To this goal we checked for MYH mutations at the most frequent hot spots, Y179C (exon7) and G396D and P391L (exon12) . No mutations were found in RCTs and in normal mucosa (Figures 2A and 2B). Genetic and epigenetic survey of a composite and pure rhabdoid tumor. (A). Genetic, cytogenetic and epigenetic analysis of the pure RCT (case I) and composite (case II) RTC. Tumor tissue of case II is characterized by a glandular (GC) and rhabdoid (RC) component whose molecular alterations are compared to the adjacent tubular adenomas (TA), the cancerized and larger tubular adenoma (CTA) or normal mucosa (NM2). Case I, a pure RCT, is compared to the adjacent distant non-neoplastic mucosa (NM1). Six CIMP loci MLH1, CDKN2A, IGF2, SOX2, NEUROG1, RUNX3 are reported. (B) Representative sequencing analysis of MYH using DNA isolated from the rhabdoid tumor tissue shows no mutations at codons 165, 382 and 391, respectively. Note: Break-apart FISH assay was used to analyze 22q12 (EWS) rearrangement as reported in Ref 2. Abbreviations: Nd: Not determined; Nr: Normal or intact locus; Re: Rearranged locus; CIMP: CpG island methylator phenotype; MSI:microsatellite instability. The presence of a CpG island methylation profile in a tumor defines the CpG island methylator phenotype (CIMP), an epigenetic alteration considered as a novel genome instability event in CRC pathogenesis [12–14]. We assessed the DNA methylation levels of six CIMP markers, MLH1, RUNX3, NEUROG1, IGF2, SOCS1 and CDKN2A in the normal mucosa, TA and RCT. Only in the RCTs, high levels of DNA methylation (from 80 to 100%) were found at the indicated loci (Figures 2A, 3A and 3B). Methylation at SOCS1 and CDH1 promoter regions was significantly higher in the rhabdoid than in the glandular component of the composite RCT (Figure 3A). CIMP loci methylation was only 30% in CTA, 16% in TA and relatively low or absent in the normal mucosa (Figure 3C). The methylation survey was extended to other genes not included in the CIMP panel, as their epigenetic changes in RCT pathogenesis have not been investigated so far. RAR β, CTNNB1, CDKN1B, CDKN1C, XPD, XPA and MGMT, among the others, did not show differential methylation levels during RCT progression; only XPD promoter methylation seemed to mark RCT specifically (Figure 3A). Genome widespread CpG island promoter methylation is a molecular feature of RCT pathogenesis. (A) The table reports the promoter methylation analysis carried out on 14 genes; six are the canonical, representative CIMP loci (MLH1, CDKN2A, IGF2, SOX2, NEUROG1, RUNX3); the others are either involved in cell cycle control as CDKN1B and CDKN1C; or in cell-cell adhesion as CDH1 and CTNNB1 or in DNA repair as XPD, XPA. The differential promoter methylation level in rhabdoid colorectal and adjacent lesions is shown. (B) Representative methylation specific PCR analysis at three CIMP loci (MLH1, RUNX3, CDKN2A) and CTNNB1 (β-catenin) in case I; (PC) indicates positive unmethylated (U) or methylated (M) control, respectively. (C) Progressive accumulation of promoter methylation at six specific CIMP loci from normal mucosa, tubular adenomas and finally to composite RCT. (D) The schematic drawing illustrates the possible CRC pathogenetic mechanisms; rhabdoid CRC originates through an alternative pathway resembling the serrated pathway. Abbreviations: glandular (GC) and rhabdoid (RC) component of rhabdoid colorectal tumor case II (RCTII). NM: normal mucosa; TA: tubular adenoma; CTA: cancerized tubular adenoma. Over the past twenty years, only seven cases of colorectal tumors with a rhabdoid phenotype have been reported [1–3]. These tumors are generally found in elderly patients at the proximal colon and show an aggressive behaviour characterized by an overall survival time shorter than 12 months [1, 2]. The main differential diagnosis is with the malignant rhabdoid tumors (MRTs), a neoplasm more common in childhood characterized by genetic inactivation of SMARCB1 (SNF5, INI-1), a component of the SWI/SNF chromatin remodelling complex or deletions at chromosome 22q [4–6]. Loss of epithelial markers, such as CK20, CDX2 and E-cadherin was observed in RCTs but neither in the matched normal mucosa nor adenomas. Although loss of CK20 and CDX2 is commonly observed in right-sided colorectal carcinoma [15, 16] with high tumor grades and high microsatellite instability, the progressive increase of vimentin immunoreactivity may indicate that the sarcomatous dedifferentiation occurs in late stages of rhabdoid carcinogenesis and could be a crucial event in the transition from adenocarcinoma to RCT [1–3]. Usually, RCTs express high levels of EGFR [1, 2], a finding that is recurrent also in other subgroups of highly aggressive CRCs. These results suggest that a combined assessment of CDX2, Vimentin and EGFR may be of clinical value to make a differential diagnosis, to predict a poor patients’ outcome or to choose the best fit biological therapy [17, 18]. INI1 loss-of-function mutations have been identified in pediatric MRTs, whereas their role in adult extra-renal rhabdoid tumors is still elusive [5, 6]. Although loss of INI1 expression is a constant finding in MRT of soft tissues, kidney or central nervous system (CNS), INI1 staining was positive in the normal mucosa, adenomas and intensely in pure RCT, and negative in the composite RCT. Loss of INI1 in MRT is mainly due to mutations and/or deletions of the 22q11.2 locus; alternatively, it may be due to epigenetic events. The 22q12 locus was normal in composite RCT with lack of INI1 whereas it was rearranged in pure RCT with an intense INI1 staining, supporting the hypothesis of gene inactivation possibly by epigenetic mechanisms. The EWS gene is located on chromosome 22q12 and its translocation with members of the ETS families is a recurrent alteration in Ewing sarcoma, although other EWS rearrangements or deletions have been identified in different pathologies including composite rhabdoid tumors of the endometrium [10, 19]. A rearrangement was detected in the pure RCT, the epithelial origin of which has already been reported . Although chromosome 22 alterations are common in MRTs, their role in CRC and RCT is still unknown and further studies are required . The APC/β-catenin pathway seems to be not affected ruling out that RTC originates through the traditional adenoma–carcinoma pathogenetic pathway underlying most CRCs (Figure 3D). A KRAS mutation was found only in the CTA, while nuclear p53 accumulation was observed exclusively in its cancerized component. Interestingly, no mutations were found in the base excision repair gene MYH, whose mutations predispose to an hereditary colorectal cancer syndrome defined “MYH associated polyposis” (MAP) characterized by multiple adenomas mainly at the right colon [9, 11]. 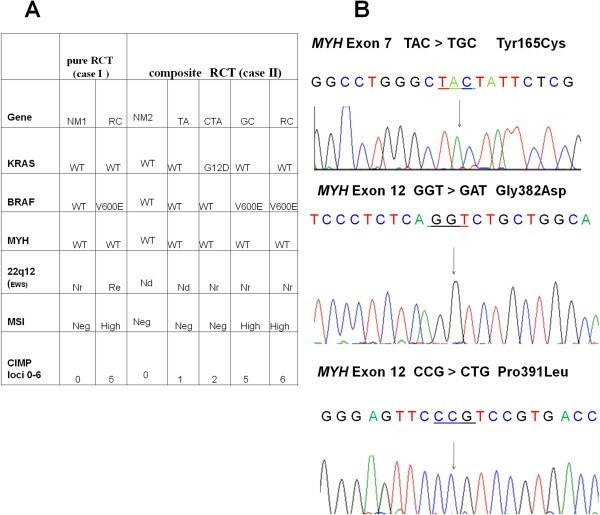 While our data do not exclude that RCT may bear causative mutations in other yet unknown loci, they, however, confirm that MYH is not responsible either for the precursor or tumor lesions. Microsatellite instability (MSI) due to deficiency of the mismatch repair system has been described in about 15-20% of sporadic CRCs, characterized by poor differentiation, infiltrating lymphocytes, a mucinous phenotype and a more proximal localization than inherited HNPCCs [12–14]. MLH1 epigenetic silencing is the most frequent event responsible for MSI and is associated with BRAF mutations in the serrated pathway [13, 20]. In our RTCs, MLH1 staining was negative, while it was nuclear and diffuse in all adenomas and adjacent normal mucosa. 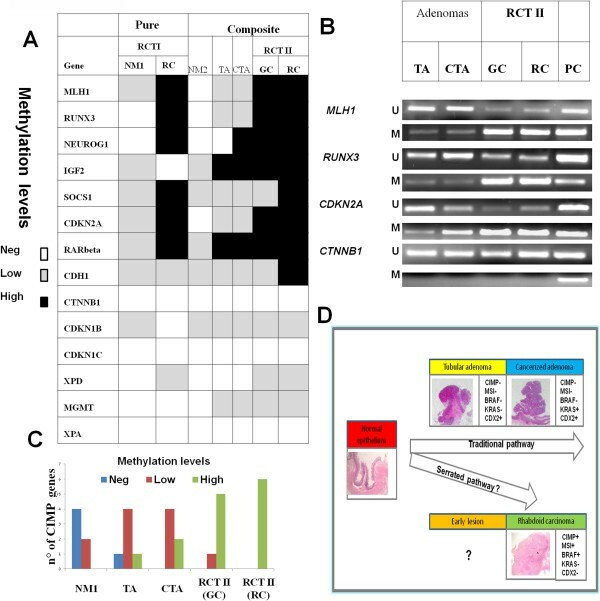 Remarkably, this expression profile was associated with the presence of BRAF mutations in the same tissues, strongly supporting our hypothesis that RTC does not arise through the traditional adenoma-carcinoma sequence (Figure 3D). Rather, it suggests that RCT may evolve through the serrated pathway . At the best of our knowledge, these genetic alterations have not been reported in MRT suggesting a colonic origin of RCT. MLH1 silencing is usually associated with hypermethylation at the CpG islands in multiple gene promoters . Interestingly, we found a progressive accumulation of promoter methylation at specific CIMP loci and additional genes from the normal mucosa to tubular adenoma, CTA and RCT. A CpG island methylation threshold seems to be required for repression of MLH1 and other important CIMP loci in the composite RCT: a promoter methylation above 60% was, in fact, required for MLH1 down-regulation, as reported [21, 22]. At the right colon, a CIMP+ phenotype and microsatellite instability (CIMP+/MSI+) may predispose to RCT development, in agreement with recent studies reporting that CIMP+/MSI+ subtypes have a worse clinical behaviour and prognosis than patients with CIMP-/MSI+ . Clinical and molecular features suggest that RCT may be considered a distinct colonic entity and could benefit from specific treatments with novel biological molecules. Right-sided RCT could be characterized by epigenetic events similar to those occurring in the serrated pathway with a marked epithelial-mesenchymal transition. Further investigations involving more cases, albeit rare, are mandatory to support this hypothesis. This work was supported by Associazione Italiana per la lotta ai linfomi e leucemie (AIL) to VC. MP, AR conceived and designed the study. MP, LS, CZ, CV, AF, FF, EM performed the experiments. MP, LS, CZ, ADB, GL, BD, EM, NN, RV and VC analyzed and interpreted the data. MP, AR and VC wrote the paper. All authors reviewed and approved the final manuscript.